Allie leads an unfocused life with no job and a lame boyfriend. So it's no surprise when she hops on the next bus (well more of an RV full of karate rockers) to Texas after being attacked on the streets of New York. Seeming to improve as she settles into the slower-pace of Austin, her fears continue to haunt her. She quickly falls into Texas gun culture as a means to feel safe. She walks the fine line between reasonable self-preservation and paranoid withdrawal. Can she maintain healthy relationships, or will the weapons she uses to protect herself cause her problems worse that the ones she was fleeing? Geoff Marslett is an award winning director, animator and teacher. His previous feature "Mars" (an animated sci-fi, rom-com) premiered at SXSW 2010. 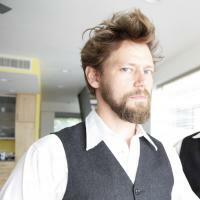 He has also directed numerous short films including "Monkey vs. Robot", "Bubblecraft", and part of "Slacker 2011". "Loves Her Gun" is his first live action feature film.